Welcome to the CMusic Production SOLO Euphonium Library! 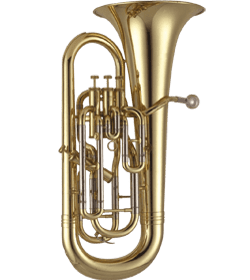 The euphonium (from the Greek word meaning “good sound”), is a baritone-voiced conical bore, valved brass instrument that was first invented in the early 1840s. Pitched in concert B♭, the euphonium is similar to the bass saxhorn, while resembling a “baby” tuba. 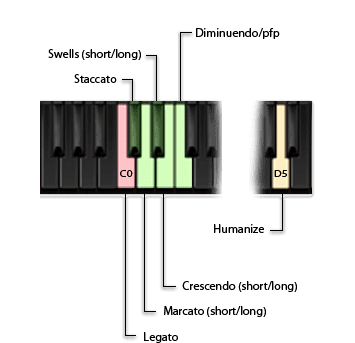 Used almost exclusively as a band rather than an orchestral instrument (most frequently in a solo role), it has in recent times begun to find its way into pop, jazz and other non-concert settings. Its rich and mellow voice is capable of adapting to the solo roles normally featuring numerous other instruments. 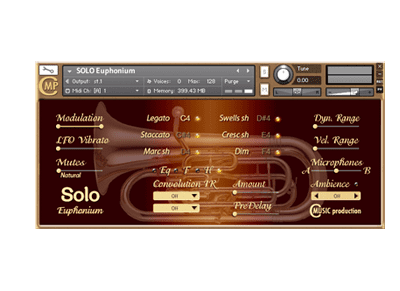 As with all of our libraries, the Euphonium Libary was recorded with all the carefully crafted articulations, SFX and expression necessary to enable you to create truly dynamic, realistic musical performances with all the user-friendly features for which CMusic Productions has come to be known. From composing a new tune for the royal marching band at Buckingham to a piece of avant garde jazz – or anything in between, why not let CMusic Production’s meticulously-recorded Euphonium Library expand your creativity horizons.